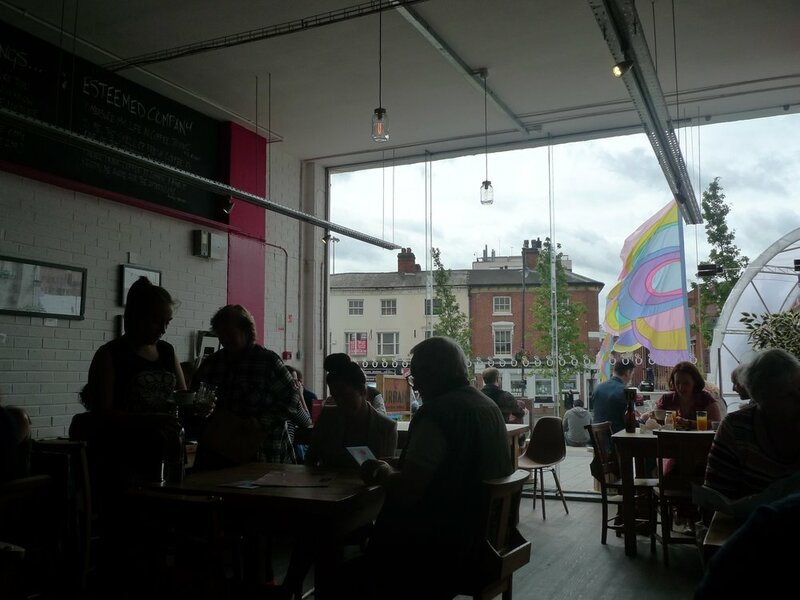 Custard Factory- A repurposed factory for artsy shops, cafes, and bars. We went to a specialty beer shop called Clink, and just walked around looking at the cool spots. The Electric- Some say this is the oldest working cinema (they certainly do on all of their signs/literature) in the UK and some say it’s Duke of York’s. I can now say that I have been to both, and enjoyed both theaters. 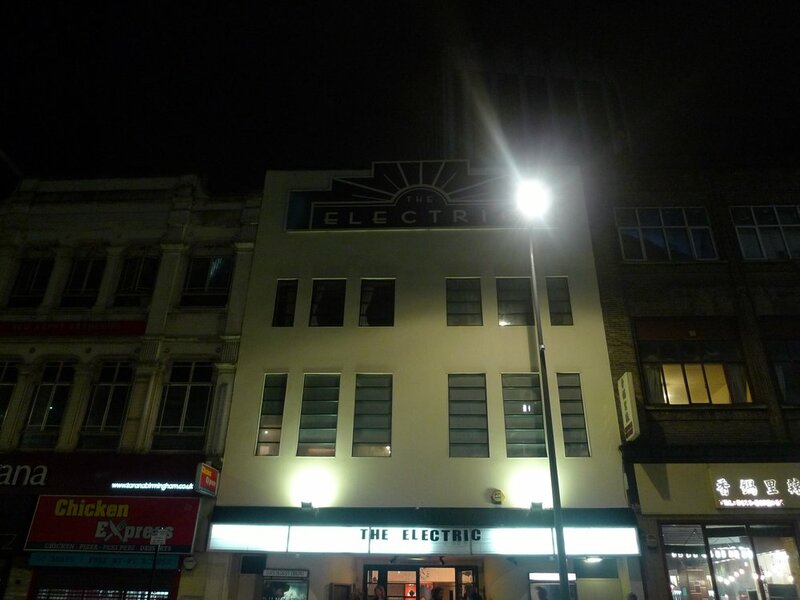 The Electric Cinema opened in 1909, but it has a somewhat modern feel now. We sat on a couch with a footstool to watch the movie, and ordered wine. Pen Museum- This museum was surprisingly entertaining. It is very well put together, and I learned a lot. For example, did you know that at the height of the pen trade Birmingham was making almost all of the pens for the entire world? 3/4 of everything written down was with a Birmingham pen. Almost the entire staff was made up of women and children, because their hands were more nimble and they had more patience for the tedious work. They also have a section with reed pens where you can practice calligraphy. A small but wonderful museum. Library of Birmingham- One reason we visited this library was to go on the rooftop and visit the secret garden. 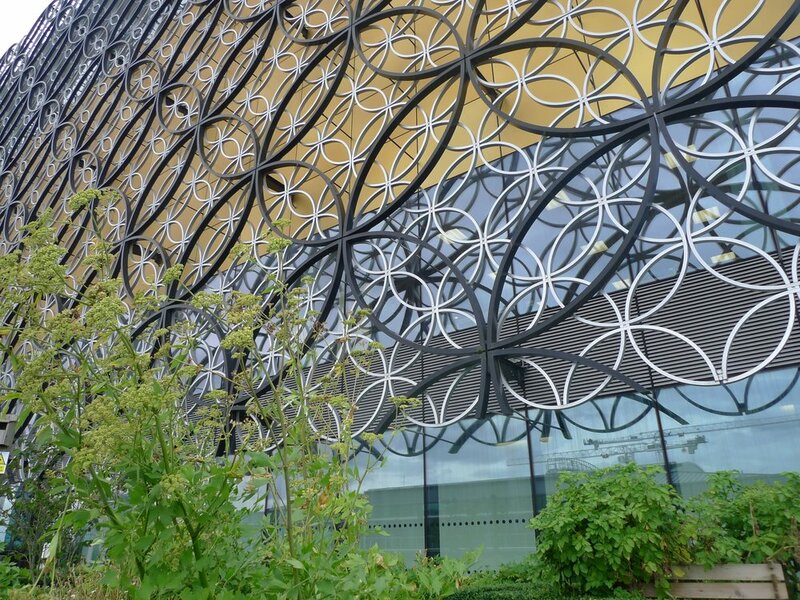 Like every library I visited in England, this one was really great, but the view of Birmingham is, well, Birmingham. It’s not going to blow you away with it’s beauty, and it will most likely be cloudy and rainy, but it still has it’s own charm. Birmingham Museum & Art Gallery- This museum houses the Staffordshire Hoard, the largest hoard of Anglo-Saxon gold ever found; The Pre-Raphaelites, the most important collection of Pre-Raphaelite art in the world; Ancient Egypt, artefacts from over 3,000 years of Egyptian life; Birmingham, a history of the people of Birmingham, which I found especially interesting, and a visiting exhibitions as well. 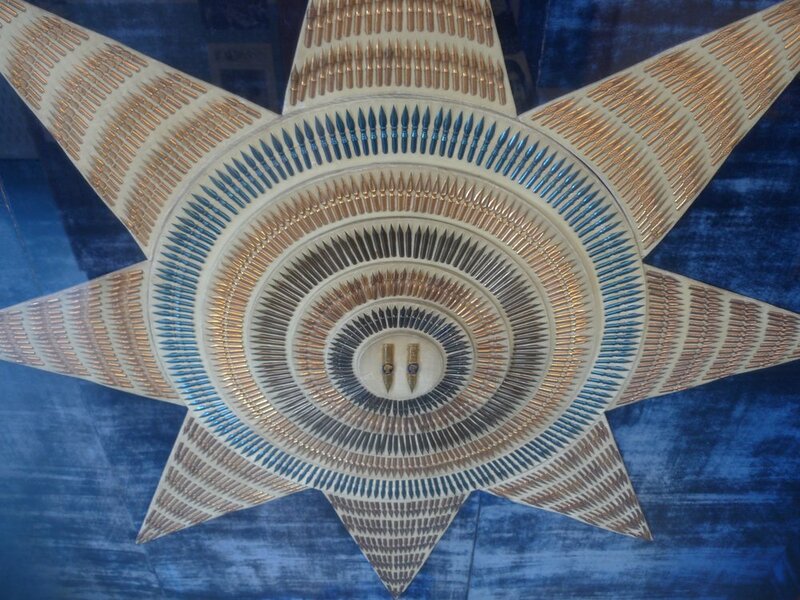 A lovely museum, and it really is amazing to learn about all of the crafts that existed and still exist in Birmingham, like pens, jewelry, and buttons. Newman Brothers Coffin Works- When you visit this factory it is less about the items in the factory and more an educational tour about what life was like for factory workers-spoiler alert-life sucked for factory workers. One of the many cruel things the owners did was frost the glass, so that the workers couldn’t even see outside while working, because they didn’t want them to be distracted. I guess that sounds a bit like an office cubicle these days. 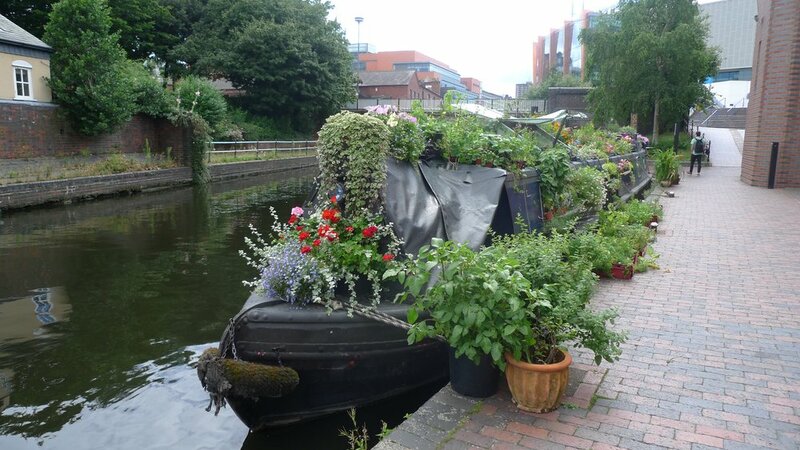 Historic Canals of Birmingham- Most of the canals were built in the 1700s-1800s, and they would have been very busy during the Industrial Revolution. Now they are quiet, little canals where people decorate their narrow canal boats, and it’s a great area to walk around, and stop in a pub for a pint when it starts raining. It will start raining. Balti Triangle- The main food we wanted to eat while in Birmingham was balti at the Balti Triangle. We chose Adil’s, a restaurant established in the 70s, known as the pioneers of balti cuisine. The food was delicious and the service was great. I highly recommend you try this type of curry that they say originated in Birmingham. *note, most of these restaurants serve non-alcoholic beverages only, but some are byob. Chung Ying Garden- Since Birmingham is so diverse we thought we could also have a good Chinese meal. This Cantonese restaurant was fantastic! We had frog legs, beef and tofu, and tripe and all of it was amazing. The atmosphere is large but still relaxed. The menu is also huge so be prepared to make a lot of choices. Lost & Found- A Victorian pub with modern pub food. This is a great stop for lunch; a beautiful restaurant that is light and airy, and it serves food that can be on the lighter side too, which was good for me since I had mostly been eating fried foods and pies on this trip. I had mussels and a salad in a really pleasant atmosphere. Tilt- This is a fun bar that serves craft beer, but the best part is that the bar is filled with pinball machines! Really cool, working pinball machines! The bartender also happens to be super friendly, and hanging out at this bar was a great way to spend a few hours on yet another rainy day. The Old Contemptibles- This is a Victorian pub that honors the men that beat the German forces during WWI, and later men of the British armed forces that would visit the pub. The pub was cozy, as most British pubs are, but it did play a strange selection of music; mostly pop music from various decades. I must say that the music didn’t really go with the decor, but it was still a nice pub for a pint. Urban Cafe- This is a cute cafe with good lattes and pleasant staff. They have a couple of locations. We chose the jewelry quarter spot, because it was near some museums we were visiting. St Paul’s House- A cute hotel across the street from a church with a cemetery. A very comfortable and quiet stay. So many great bands are from Birmingham! But the one that immediately makes me think of Birmingham is of course Black Sabbath. The band that sounds like a rain storm and a factory combined. The band that is also from there that I had no idea and doesn’t make me think of Birmingham at all is ELO-such a happy sounding band that even sings of sunshine.